It’s very interesting reading books while you’re traveling, as they seem to take on a new life depending on where you are that coincides with your head space at the time. I remember being in Venezia (Venice, Italy) and being completely absorbed with Orson Scott Card’s “Ender’s Game”. In Edinburgh, I found myself frequently wanting to get home early (despite falling in love with the city), so I could finish Ben-Hur. Interestingly enough, I missed a few sights in Edinburgh due to books. I was walking to the Royal Botanical Gardens (a long trek from the city), and I found a really interesting book store with Dickens’ first editions and an eccentric Scot who talked to me until his store closed down. I missed two other bookstores on the street because of all my chatting, and the Botanical Gardens as well. But, as Steinbeck states “You don’t take a trip, a trip takes you,” and I believe my conversation with this bookseller was more important to my overall knowledge of books, book selling, UK bookstore distinctions from North America, Edinburgh city planning, and a multitude of random topics. That was a slight digression. 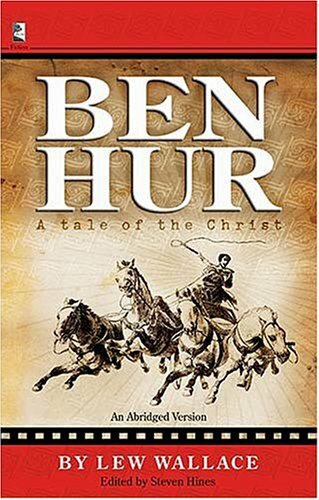 Now on to Ben-Hur, written by Lew Wallace. I originally bought Ben-Hur due to the great movie with, if memory serves, Charlton Heston, which won best picture in 1980 if I recall correctly. The parts I remember the most as a youth were those of the chariot scenes in the Roman Coliseum – and I guess I thought this was going to be a book about the gladiators. I couldn’t have been more wrong. This book is all about the life and meaning of Jesus and the struggle between the Romans and the Jews. Ben-Hur is a descendant from a prominent Jewish family who is incorrectly accused of attempted murder on the Roman emperor Gratus. Gratus puts Ben-Hur into a life of slavery as a rower of military ships and his family is removed from their home, which is seized by the Romans. Ben-Hur eventually becomes free and plots a course of revenge and a quest to find his mother and sister. As Ben-Hur searches for his family, he also searches for a life meaning. 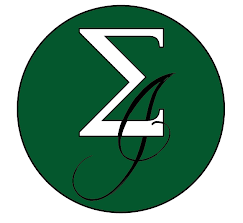 He eventually comes to the conclusion that his purpose is to help the King of the Jews in his endeavors, both physically and financially (since, by this time he is a wealthy man). His initial belief is that Jesus has come to overthrow Rome and become King, and only later does he learn that Jesus of Nazareth has come to save the souls of men and show them life through his resurrection. In addition, Ben-Hur has found what he believes to be love with the daughter of a wise Egyptian Sheik. Her physical beauty knows no bounds and she has a sharp tongue and an independent and saucy personality. He also has an attraction to a sweet, simpler Jewish woman named Esther. I can relate to Ben-Hur’s struggle between the women and his desires for finding a mate. There is some great writing about love. One of my particular favourites is the determination of a moral of an ancient Egyptian tale. The Egyptian states that the only cure for love is another love, while Hur exclaims that the only cure for love is death. I’ve been thinking a lot about this and it’s hard to pick answer if forced to. For those worried that this book will be too religious, I’m going to attempt to quell your concerns. I found the back story of Jesus, which I have heard a million times before, was finally brought to life for me. The impact of Herod was also present, and it was very enjoyable to get a feeling like you were brought back in time (whether of fiction or non-fiction, I will not debate). I really felt transported and that my knowledge of the time period, if not strengthened, was enhanced by what I read. The characters were all very three dimensional to me and I felt interested in all of them. 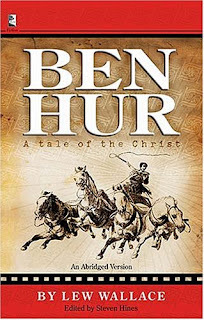 Ben-Hur himself was presented with faults, but I was surprised that only a few of his weaknesses came back to haunt him. I felt that his quest for revenge and vengeance instead of Christ’s teaching of love for all mankind, should have made itself known to him if not spelled his doom. Neither outcome occurred. However, his lackadaisical nature is protecting his past (ie: his loose tongue), did constantly create difficulties for him and Wallace makes this very evident slightly before the end of the work. I didn’t find myself wanting to write down very many quotes, but a lot of the dialogue was very engaging. Wallace does have a tendency to talk to the reader, something that I don’t generally like. It was distracting at points, as he explicitly states in the novel why he has outlined a scene prior to – for the benefit of the reader. This should be implicit instead of stated directly, and it made me feel as if I was being talked down to a bit. The story also seemed to lack fluidity when the backdrop and history of scenes were drawn out in too great a detail, but this was an infrequent occurrence throughout the work. Overall the book was an enjoyable read with concepts and historical context that I believe will take with me on my travels through this life. I have watched the film, long ago, with my father. He insisted that it was good, so I watched it just to please him. But it turned out to be touching and beautiful. I didn't know that it's adapted from a novel. Some in Goodreads say that the unabridged version is boring. Do you think it is so? I don't think so, but sometimes with classic literature you need to plug through to get to the really good stuff. It was worth it, in this case, IMO. The movie is an all-time favorite of mine! I read the book years ago; didn't appreciate it then, but it sounds like it would be worth a re-read. I recently found an unabridged copy of this in our library room. Thanks for the post om it, I think I might start reading it as soon as I am done with my current read: Tale Of Two Cities.=) Thanks again. Ben Hur is a favorite movie of mine. I once bought a very old edition of the novel but haven't opened it in many years.